Pot lights are a form of recessed lighting fixtures that are embedded into a room’s ceiling. A pot light’s housing and trim can support halogen, fluorescent, incandescent, and LED light bulbs, enabling a great deal of flexibility. Their recessed nature make pot lights unobtrusive and perfect for low-ceilinged rooms and the housing and bulb style offer many different combinations to create the perfect ambiance for a room. For instance, wide-angle housings can give illumination over a general area, while narrow, downward housings enable task-oriented lighting over a kitchen counter or workbench. If you are planning on a pot light installation for your Toronto home or office, here are a few questions to keep in mind that will help you make your new lights as affordable and efficient as possible. 1. How Many Lights Do I Need? Assessing how many pot lights your installation requires is a basic but important first step. Too many lights and you waste money for little extra benefit; too few and you are left with weak or spotty illumination. Step 1: Establish how much wattage the room requires for total illumination. The rule of thumb for determining the necessary wattage is to take the area of the room and multiply it by 1.5. For instance, take a room that is 15 feet by 18 feet; the total area (length times width) is 270 square feet. Multiply that by 1.5 to reach 405. Therefore, to efficiently light the room, you will need 405 watts. Step 2: Turn the wattage value into the number of bulbs required. To do so, divide the total number of watts by the wattage of the desired bulb. For instance, if we were to use a 50-watt bulb for our 405-watt room, we would find that we need eight bulbs (405 ÷ 50 = 8.1). 2. How Should I Space the Lights? Having the right number of bulbs won’t do much good if they aren’t spaced efficiently. All pot lights should be installed at least two feet away from the walls and have at least two feet of space between each other. 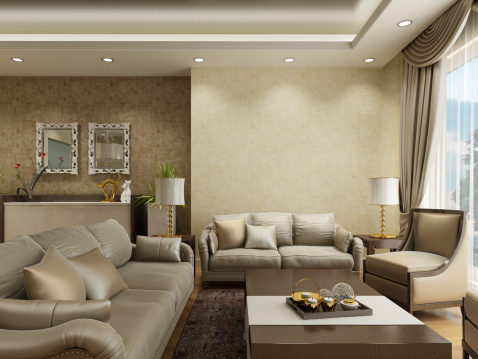 However, note that this is a general rule that assumes you are providing general illumination to a room; the exact distance between individual pot lights can be smaller if you require multiple directed, task-oriented lighting sources close together. 3. Do I Have Ceiling Access? Since the pot light will be installed inside the ceiling, whatever is above it will impact the ease of the installation. The easiest pot light installation is done when you have an attic, since you can go directly above the desired location and work downwards to use a nailed-in construction housing. If you lack direct ceiling access, then the ceiling must have a hole cut into it from below. To avoid cutting too deep or shallow, double-check the clearance height of your housing before beginning. Use a stud finder to ensure the fixture has proper space between internal joists as well. 4. Will the Light Be in Contact with Insulation? If the pot light installation is in contact with insulation, a special housing fixture will be required to avoid electrical hazards. Fortunately, any pot light housing that can safely touch a home’s insulation will be labeled as insulation contact (IC) housing. Note that sometimes it’s not possible to tell whether the fixture will be in contact with insulation depending on how much ceiling access you have. In these instances, it is better to err on the side of caution and spend a little more on an IC fixture rather than risk the damage and costs of doing otherwise. 5. How Many Dimmers Do I Want? Dimmers are a flexible way to control a pot light’s illumination, both for lighting purposes and to prolong a bulb’s lifespan while saving energy at the same time. Despite this, it is inadvisable to have all of a room’s lights connected to the same dimmer switch; mentally divide your room into zones, with each zone getting its own dimmer. This will allow for maximum flexibility in your pot lighting installation, plus you may find some areas that won’t require a dimmer switch at all. This is a big project and not one that should be undertaken without proper training and experience. You should hire a professional for any pot light installation. They can install exactly what you’re looking for while ensuring the installation is done properly and safely. Toronto Electrical Experts’ credentialed and experienced electricians know the best ways to deliver pot light installations to the Toronto area. Contact us to get your beautiful, affordable pot lights installed the right way.